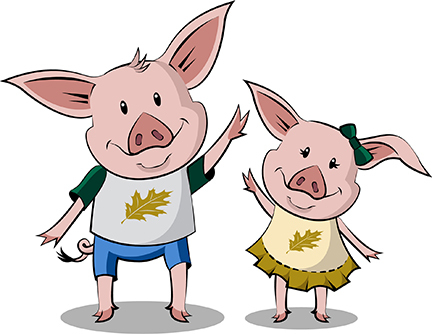 Hometown Bank came to our own illustration expert Christina Knapp in need of some fun piggy characters to promote their new childrens checking and savings accounts. This project was a lot of fun, using some basic guidelines from the client along with Christina’s fun illustration style we came up with Homer and Holly. Later on they used our illustrations to create a Homer mascot, there’s nothing more fun than watching your illustrations come to life! Watch Homer on WDBJ7 here http://www.wdbj7.com/news/local/hometown-bank-encourages-children-to-learn-to-save-money-through-its-kids-club/23956948.